I was thinking about all of the great exercise that I get while working in my eco-friendly landscape, so I decided to find out just how much good all of this bending and stooping is doing for my body while I try my best to “do good” for the planet. ** Estimates for calories burned are from the fitness and exercise directory that I found on the LiveStrong website and are based on the weight of a 120 lb. female. 1) Sweeping your driveway and sidewalks – It is bad for the environment to leave grass clippings, fertilizer or other substances on a driveway where they will wash into storm drains and pollute local waterways. Sweep up all clippings and add them to your compost pile or your gardens for added mulch. 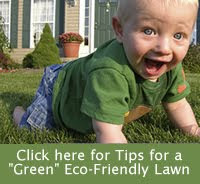 Sweep up any spilled fertilizer and put it back in your garden. Health benefits: This activity burns approximately 288. 3) Bagging leaves – if you don’t have your own compost pile, bag your leaves and give them to a friend or neighbor who does. Health benefits: This activity burns approximately 218 calories per hour. 4) Building raised bed gardens – raised bed gardens help prevent overwatering and over fertilizing. Health benefits: Outside carpentry burns approximately 327 calories per hour. 5) Installing rain gutters – utilizing rain gutters and downspouts to redirect rainfall into the grass and gardens helps prevent stormwater runoff. Health benefits: Installing rain gutters burns approximately 432 calories per hour. 6) Creating compost - Composting is a natural process that involves the decomposition of biodegradable matter such as fruits, plants and vegetables. Health benefits: This activity burns approximately 272 calories per hour. 7) Digging – Planting eco-friendly plants helps conserve water and the environment. Digging in a garden engages both the upper and lower body, and any tools and equipment you use provide resistance. Health benefits: This activity burns approximately 272 calories per hour. 8 ) Gardening (general) - Gardening exercises and activities involve preparing soil, pruning plants, planting bulbs and maintaining flowers, plants and vegetables in a garden plot - Health benefits: This activity burns approximately 259 calories per hour. 9) Weeding – hand weeding instead of using chemical herbicides is healthier for the planet. Health benefits: This activity burns approximately 331 calories per hour. 10) Hauling compost – Using compost is a great way to conserve water. Hauling compost and mulch across various distances can engage the upper and lower body in constant movement. Health benefits: This activity burns approximately 245 calories per hour. 11) Hoeing – Hoeing by hand is a great way to work the soil and remove weeds. Health benefits: This activity burns approximately 272 calories per hour. 12) Kneeling to pull weeds - Kneeling will engage your thighs and glutes as you bend and sit for various intervals of time. Health benefits: Kneeling burns approximately 54 calories per hour. 13) Lawn mowing, pushing a hand mower – push mowers are better options for the environment than riding mowers or power mowers. Health benefits: This activity burns approximately 327 calories per hour. 14) Laying crushed rock – crushed rock is a great pervious surface to use in the landscape to allow water to percolate into the yard. Health benefits: This activity burns approximately 272 calories per hour. 15) Picking flowers and fruits – enjoying the fruits of your labors makes eco-friendly gardening so much more fun! Health benefits: This activity burns approximately 163 calories per hour. 16) Picking up litter - Picking up litter helps the environment -- and your waistline! Health benefits: This activity burns approximately 274 calories per hour. 17) Planting trees - Planting trees help shade the home and landscape - Health benefits: This activity burns approximately 331 calories per hour. 18) Planting native plants - Planting seedlings, shrubs and trees may require you to stoop, squat, bend and lift various gardening materials and tools as you complete the task. Choosing native plant species is often better for the environment. Health benefits: This activity burns approximately 245 calories per hour. 19) Pushing a wheelbarrow - Pushing a wheelbarrow while walking employs one of the best aerobic activities available — walking. Coupled with the added resistance of the wheelbarrow and contents, pushing a wheelbarrow will typically expend more energy than walking on your own. Health benefits: This activity burns approximately 272 calories per hour. 20) Shoveling compost, dirt, etc - Shoveling moderate loads, such as dirt from your garden, is a good way to get your daily workout and build muscular strength at the same time. Health benefits: This activity burns approximately 381 calories per hour. 21) Tilling the soil - Before the first seed or sprout can be laid, gardeners must till the soil to prepare it for planting. Health benefits: This activity burns approximately 327 calories per hour. 22) Trimming shrubs and trees manually – Using hand tools is always better for the environment AND your body. Health benefits: This activity burns approximately 331 calories per hour. 23) Hand watering plants – Watering by hand helps prevent overwatering. Health benefits: This activity burns approximately 187 calories per hour. Makes you wonder why so many contractors appear overweight! This is a super post! I've been discovering the health benefits of yard work and wondered how much it really was. I worked an hour and a half raking leaves and wheel barrowing..and pruning..and pulling weeds.